If you live in a home with limited space, you may be wondering how to create a functional nursery to accommodate your baby's needs. Don't worry. You won't have to relocate to make room for your new addition. The good news is that most of the bulky baby gear that's advertised for babies isn't necessary. In fact, an infant typically requires very little to be completely satisfied. A bassinet is a nursery essential that's great for smaller homes. It's the ideal space-saving nook for your infant's first several months. Babies are usually quite content sleeping in a cozy bassinet. Many parents choose a bassinet because it provides a cocoon-like bed that's similar to the womb. Are you looking for a bassinet that's just the right size for your home? Read on for the best bassinets that can be used in the smallest homes! Bigger isn't always better. Some of the best bassinets we've found will fit practically anywhere. But don't let their petite size fool you. These bassinets are functional and stylish enough to rival any of the bigger guys. And, you'll love how easy they make baby's bedtime too. Simple and elegant. The Chicoo LullaGo Portable Bassinet is streamlined and perfect for your little one. 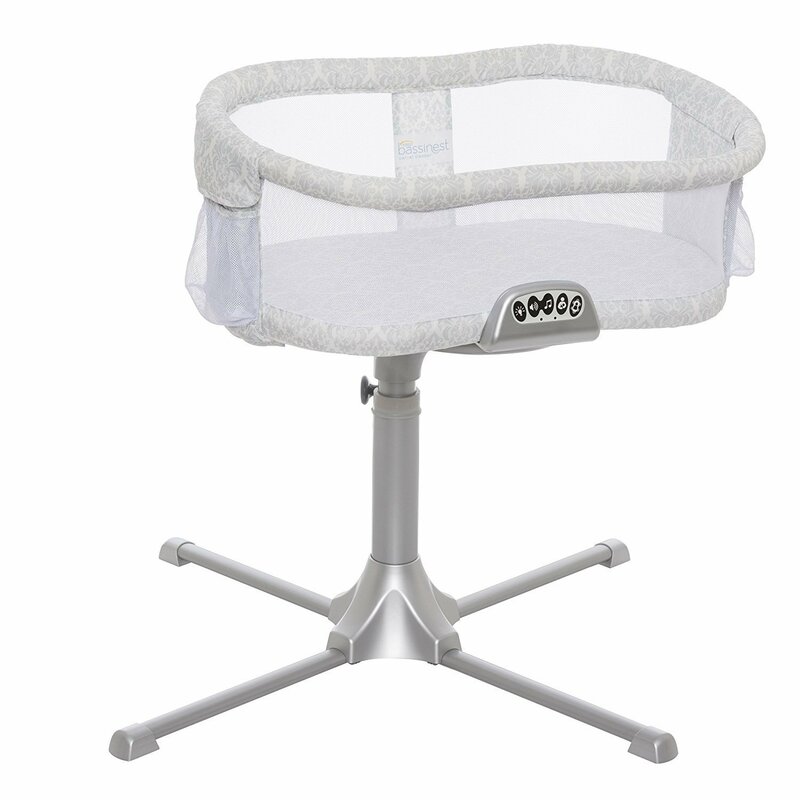 The bassinet has an easy set up with snap-on legs and comfortable one top structure. It has a sturdy frame that is lightweight and portable, weighing less than eighteen pounds. The manufacturer states that this bassinet can be dissembled in less than one minute and conveniently folded into its matching carrying bag for easy transport. The sizeable padded mattress has a zip off pad that can be machine washable which is great for easy cleaning. There are also mesh side panels for visibility and ventilation of your little one. The portable bassinet is recommended for babies who are under twenty pounds or before your child starts to push up on their hands and knees. Many customers give the LullaGo portable bassinet very high reviews for its comfortability and mobility. If you're looking for an elegant, lightweight, and very reasonably priced bassinet that can go practically anywhere, this one is for you. The Dream on Me Karley bassinet is one of the best bassinets you will find for such a reasonable price. It comes in several different colors, features a canopy, rocking motion, large underneath storage basket, and weighs only 14 pounds. Its collapsible frame makes it easy to travel with your tiny tot. And when it's folded down, it's almost entirely flat. It fits in even not-so-roomy trunks and can be conveniently stowed away when not in use. Customers raved about this little powerhouse. The only drawback? Don't expect to use it after your baby reaches 25 pounds. The New Halo Bassinest Swivel Sleeper Luna provides luxury in a bassinet. Halo is the only bassinet manufacturer on the market to be able to rotate 360 degrees and have adjustable height options. With less than 32” inches for wall clearance, the Halo Bassinest Swivel Sleeper is the ideal option for parents who want to save space in their room and have the convenience of keeping their baby by their side. Simply put, the Halo Bassinest Swivel Sleeper bassinet is utter perfection. It is for the mom who prefers to keep their baby next to them at all times without bed sharing. The Luna has a small footprint while creating a comfortable and separate sleeping area for the baby. The best bassinet option for all moms especially ones who have had a C-section. 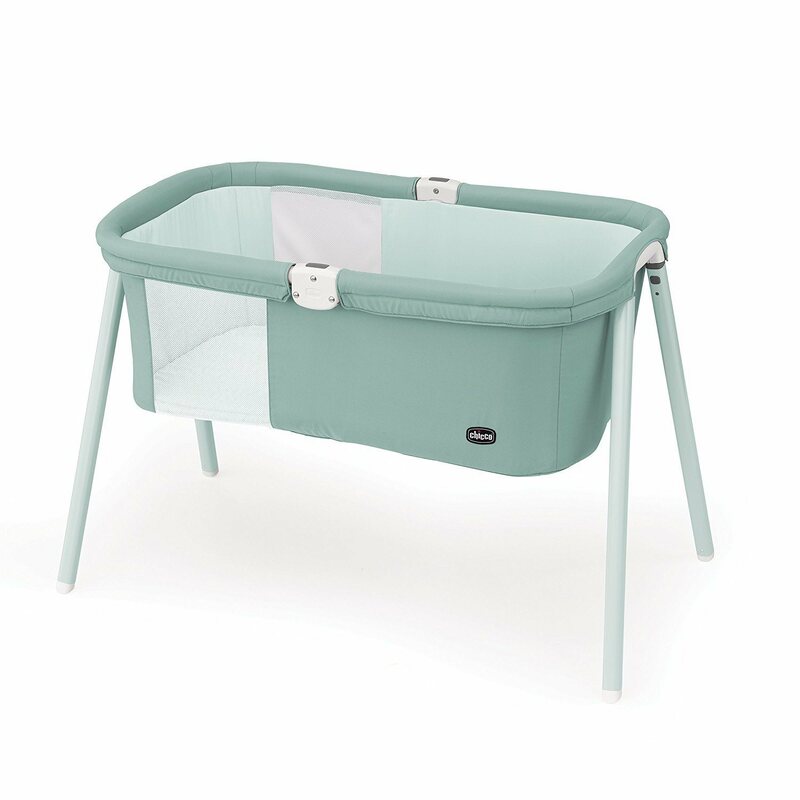 The bassinet measures 43" L x 43" W x 34" H and is made out of aluminum, steel and high-impact plastic making it roomy and durable. It has mesh-side profile walls, and it folds down quickly which makes it easy to access your baby for regular feedings or diaper changes. The mesh walls also lock into place when needed. Easy viewing makes this bassinet the ultimate option for convenience and safety. Included with the Halo bassinet is a volume control module of three lullabies, three soothing sounds, two levels of vibration and night light. It also has a thirty-minute thirty auto-shutoff and Back to Bed reminder for mom/dad. Two large pockets included for easy access to baby essentials. The Halo Bassinest Swivel Sleeper bassinet can be wiped clean with a damp cloth is a bonus for easy cleanup. The bassinet sheet is also machine washable. The manufacturer recommends using the Halo Bassinest Swivel Sleeper Premiere Series Bassinet up until five months old or until your infant starts showing signs of rolling over, pushing up to a kneeling position or pulling up. Weight capacity of twenty pounds. We love the versatility of the Halo bassinet and the mesh side walls. Another winner for small spaces in our book! For the ultimate space saver, we love the Moses basket bassinet by Tadpoles. It's easy to see why this comfy classic has been a nursery mainstay for generations. They offer a simple solution for your infant to catch their Z's. Most models come with a firm mattress and without any detachable toys that physicians warn against. 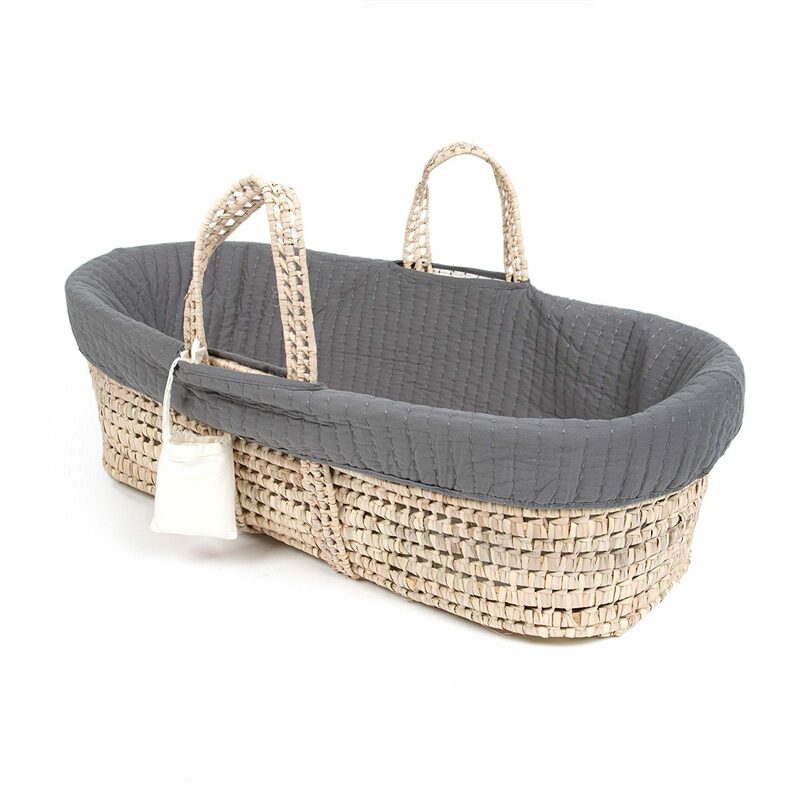 Moses baskets start at about $30, but some of the higher end brands cost hundreds of dollars. Some parents worry that their little one might quickly outgrow the basket bassinet. There are larger models available today which can be used for the first several months if this is a concern. Once they are no longer used for sleeping, the Moses basket makes charming storage baskets that can be filled with toys, diapers and more. A classic winner. The word beautiful cannot begin to describe the Sorbus Baby Crib Cradle. This durable hanging bassinet and portable swing look so luxurious that any parent would want one for themselves if they offered it in adult size. This 100% cotton macramé rope fringe creation stands out from the rest. This adorable little bassinet, measuring 35" L X 23.25" W X 47" H, can be hung anywhere. 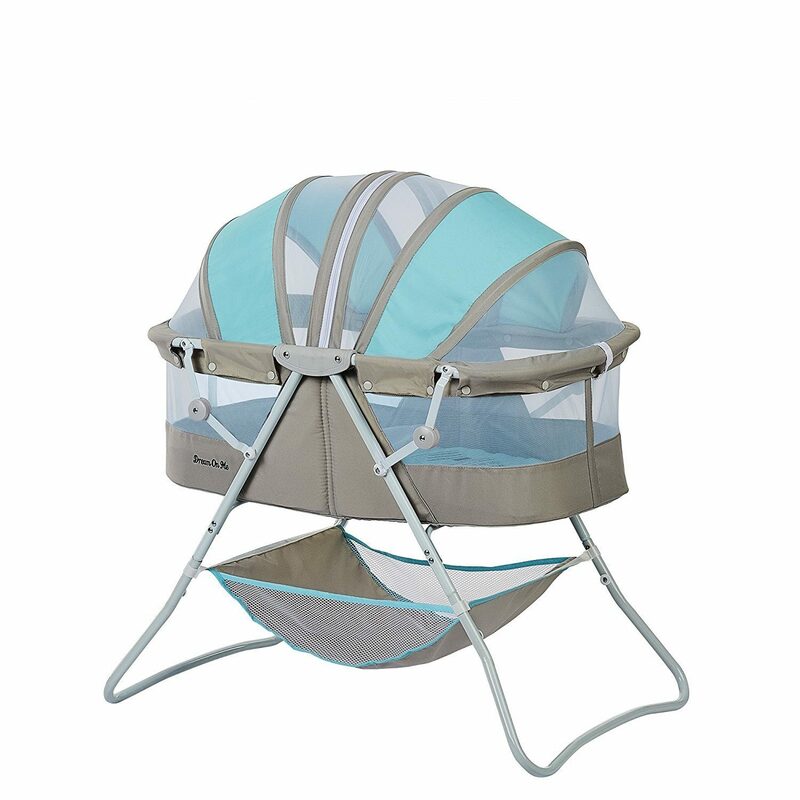 It’s safe and comfortable and features a soothing and gentle rocking movement for your baby. It's neutral, organic material and hearty rope can transition smoothly into your home's everyday living areas. Your little one will feel super-comfy and safe up until twenty-one pounds. It's affordable, and we fell in love with its luxe design. Win. Win. 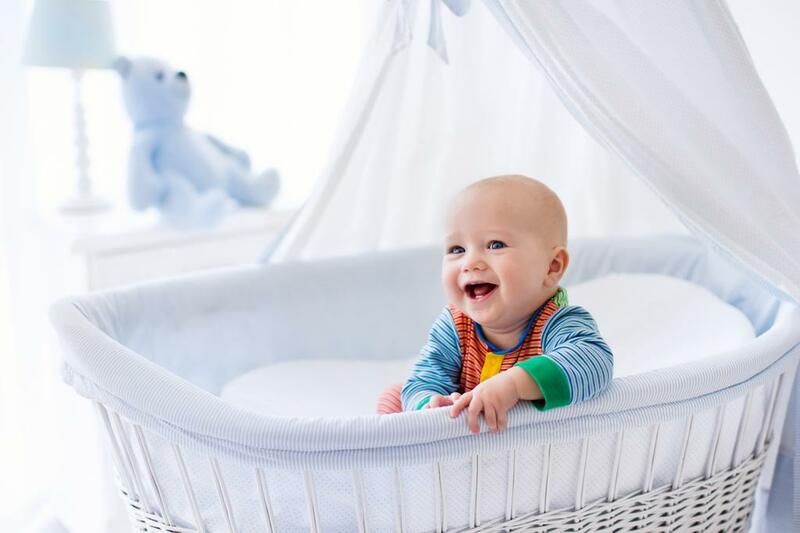 A bassinet will be one of the items that you and your baby rely on most during the first months of their life. It's essential that the bassinet that you choose is one that fits your home and lifestyle. With all of the bassinet options available for today's families, you can be sure that there's one that you and your little one will love. Our pick for Best Bassinet for Small Spaces winner is the Chicco LullaGo Portable Bassinet. The sleek and straightforward foldable design makes it stand out from the rest. The LullaGo bassinet also provides your baby with a large sleeping area without taking up too much space in your bedroom or anywhere you travel. The small footprint and matching carrying bag is ideal for any anyone who needs to be on-the-go. The best bassinet for your small space is a personal choice. Choose any one of the above. These bassinets all are compact and will provide your little angel with many z’s ahead. Check out our reviews where our list of the best bassinets on the market continues!